Last season the Oklahoma CityThunder took the NBA by storm as they became one of the most exciting young teams in the league. 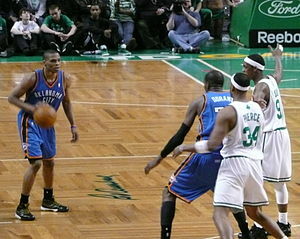 Even though the Thunder were extremely entertaining to watch with the league’s youngest scoring champion in history leading the way with a lightning quick point guard running the show, no one really took them seriously when they headed into the playoffs and were matched up against the NBA champion Los Angeles Lakers in the first round. Obviously, a team like the Los Angeles Lakers which is coached by one of the smartest head coaches in NBA history in Phil Jackson, is not going to take any team lightly as it can be a recipe for disaster. Despite most people around the league and NBA analysts saying that the Thunder had no chance against the defending champs, Kevin Durant and company put on a show in the first round as they surprised everyone by taking the Lakers to six games. Not only did no one expected this out of a young and inexperienced Oklahoma City Thunder team, but the defending NBA champion Los Angeles Lakers were taken aback by it as they really didn’t expect the young team like this to give them this kind of a challenge right out of the gate in the playoffs. As it always seems to be for the Lakers, it was the guard play that really got under the skin of the defending champs as veteran point guard Derek Fisher just couldn’t stay in front of up and comer Russell Westbrook. With his dominant performance night in and night out, Westbrook proved to everyone that he might be the next big thing at the point guard position in the NBA. Even though till this day, this kid out of UCLA, still doesn’t get the credit he deserves , and in many NBA circles he is still considered to be one of the best point guards in the game today. This season the Oklahoma City Thunder were no surprise to the rest the league like they were last year as everyone knew this team wasn’t a fluke and was ready to compete with the best of the best in the Western Conference. Even though they did struggle at times during the NBA regular season, they have been able to get back on track and look to be on their way to clinching the fourth seed in the West. Whether or not they can remain a dominant team in the playoffs is a big question for this squad, but many people believe that they will be a force to be reckoned with once again and seem to be on their way to a first-round matchup with the Denver Nuggets. If it does turn out that the Oklahoma City Thunder do matchup with the Denver Nuggets in the first round, it wouldn’t surprise me and many others if they are able to pull off the sweep and advance to the second round in the Western Conference.